Tamara Carleton, Ph.D., is a global leader in helping organizations to create vision-led, radical innovations. She is the CEO and founder of Innovation Leadership Board LLC and lead author of the Playbook for Strategic Foresight and Innovation, a hands-on guide that has been used by hundreds of the world’s most innovative companies to make their teams more successful. She also works closely with the Stanford Foresight program at Stanford University in the heart of Silicon Valley, where she explores how the world’s most innovative companies create technology visions and take action. Previously she was an Innovation Fellow with the US Chamber of Commerce Foundation, a Fellow with the Bay Area Science and Innovation Consortium, and a Fellow for the Foundation for Enterprise Development. She has also worked as a management consulting at Deloitte Consulting LLP, specializing in innovation, customer experience, marketing strategy, and enterprise applications. Her research focuses on building cultures and abilities for continuous innovation. She has converted this research into tools and methods for developing visionary leadership, innovation cultures, action foresight, and design innovation. She is a leading authority on DARPA’s model of innovation, the most successful organization over the last 60 years in creating breakthrough technology-driven visions. A multidisciplinary scholar, Dr. Carleton holds a doctorate in mechanical engineering from Stanford University, a masters of science from Syracuse University, and a bachelor’s degree from The George Washington University. She has published widely in academic and technical journals, as well as the general business press. She is frequently invited to discuss her work in the United States and abroad. Follow her on Twitter @carleton. Weili Dai currently serves as a Director of the Board in Marvell Technology Group. She is the only woman co-founder of a global semiconductor company, and since it began in 1995, she has helped Marvell's rise to become one of the top semiconductor companies in the world. Ms. Dai has served a pivotal role in creating some of the Company's most important strategic partnerships and under her leadership Marvell's technology has become an integral component of many of the world's most important products in enterprise, communications, mobile computing, consumer and emerging markets. She has also become a driving force in expanding access to technology in the developing world and an ambassador of opportunity between the US and China, particularly in the arenas of education and green technology. For her contributions to technology and society, Newsweek named Ms. Dai one of the "150 Women Who Shake the World" and was recently profiled by CNN International for the Leading Women Series. Additionally, Forbes Magazine lists Ms. Dai as one of the "World’s 100 Most Powerful Women". Dr. Jennifer Dawson joined SSL in 2010 as a Senior Spacecraft Systems Engineer. In that position, she performed critical analysis of satellite design and led teams in design, test, and anomaly resolution. In particular, she led the mechanical design and environmental accommodation team for a NASA-hosted payload. Jennifer became the Chair of SSL’s Shock Committee in 2012 where she was responsible for defining company-wide pyroshock qualification requirements. In 2015, Jennifer was one of the youngest employees to ever be promoted to Product Assurance Program Manager where she led the mission assurance team on one of SSL’s spacecraft to ensure spacecraft quality and reliability. Jennifer was a recipient of the 2016 Society of Satellite Professionals International (SSPI) Promise Award, which recognizes future leaders of the satellite industry. She is now a Director of Marketing and Sales at SSL. Jennifer earned a BS in mechanical engineering from Bucknell University and a MS and PhD in mechanical engineering from Stanford University, including research on two satellite programs: Gravity Probe B and Satellite Test of the Equivalence Principle. Prior to joining SSL, Jennifer spent two years as a tenure-track mechanical engineering faculty member at York College of Pennsylvania. ​Ashley earned her Master’s degree in Mechanical Engineering at Stanford in 2009 after receiving her Bachelor of Applied Science from the University of Toronto in 2007. During her time at Stanford, she had the opportunity to partner with an international organization in Myanmar in the design of affordable farming tools as part of the d.school’s Design for Extreme Affordability class. She also built 3D laser depth scanners for the Artificial Intelligence lab and served on the core team for the 2009 Freedom Summit conference on human trafficking. After graduating from Stanford, she began her career at a CleanTech solar start-up developing thin film technology. She joined Intuitive Surgical’s instrument development team in 2010, and has since taken three successful products from alpha-stage design through FDA approval and product launch, including the industry’s first fully-wristed stapler. She served as the design team lead on the latest market release, and currently leads the development of a next generation product. Her 3D laser sensing work was published in the 2009 IEEE Conference on Robotics and Automation, and she has several granted and pending patents. Ashley is continually inspired by the experiences and relationships developed during her tenure at Stanford and Intuitive, and hopes to inspire the next generation of engineers to pursue their dreams. In 1994 Azadeh received a doctoral degree in physical chemistry from UCLA. Since then, she has worked as a Senior Research Scientist at NASA Ames and an Associate Professor of Geophysics at Stanford University. She has published over sixty scientific articles and has received prestigious awards/medals from major scientific and government organizations, including the American Geophysical Union, the American Meteorological Society, the American Institute of Physics, NASA, and the White House Office of Science and Technology. Among her many accolades are a Presidential White House Science Award, a feature article in Time that details her personal life and scientific discoveries, and being named by Popular Science as one of the “Brilliant 10” young scientists in the United States in 2002. Azadeh Tabazadeh is the author of The Sky Detective, a debut memoir about her childhood and adolescent years in Iran. Azadeh fled Iran in 1982, two years after the Iraq invasion of Iran, to pursue her dream of becoming a scientist. Kirkus Reviews has named The Sky Detective as one of The Best Books of 2015. 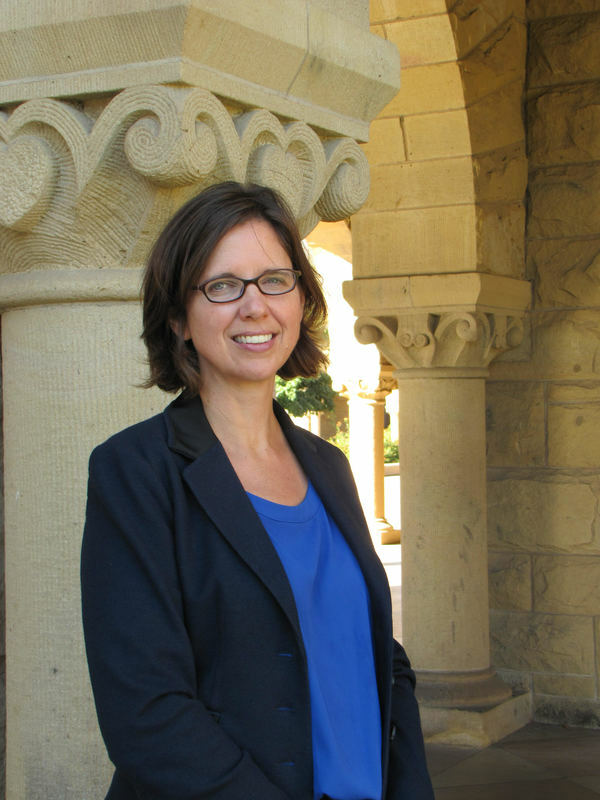 Christianne Corbett is a second year PhD student in sociology at Stanford. Her research interests center on social psychological approaches to the study of gender in engineering and technical work environments. Christianne has worked as a legislative aide on Capitol Hill and as a mechanical design engineer in the aerospace industry. Christianne is an author of two National Science Foundation-funded American Association of University Women (AAUW) reports : Solving the Equation: The Variables for Women’s Success in Engineering and Computing (2015) and Why So Few? Women in Science, Technology, Engineering, and Mathematics (2010). Christianne holds bachelor’s degrees in aerospace engineering and government from the University of Notre Dame and a master’s degree in cultural anthropology from the University of Colorado. Allison Godwin, Ph.D. is an Assistant Professor of Engineering Education at Purdue University. Her research focuses what factors influence diverse students to choose engineering and stay in engineering through their careers and how different experiences within the practice and culture of engineering foster or hinder belongingness and identity development. Dr. Godwin graduated from Clemson University with a B.S. in Chemical Engineering and Ph.D. in Engineering and Science Education. She is the recipient of a 2014 American Society for Engineering Education (ASEE) Educational Research and Methods Division Apprentice Faculty Grant. She has also been recognized for the synergy of research and teaching as an invited participant of the 2016 National Academy of Engineering Frontiers of Engineering Education Symposium and 2016 New Faculty Fellow for the Frontiers in Engineering Education Annual Conference. She alsowas an NSF Graduate Research Fellow for her work on female empowerment in engineering which won the National Association for Research in Science Teaching 2015 Outstanding Doctoral Research Award. Dr Jo Boaler is a Professor of Mathematics Education at Stanford University, and the co-founder of youcubed. She is also an analyst for PISA testing in the OECD, and author of the first MOOC on mathematics teaching and learning. Former roles have included being the Marie Curie Professor of Mathematics Education in England, a mathematics teacher in London comprehensive schools and a lecturer and researcher at King’s College, London. Her PhD won the national award for educational research in the UK and her book: Experiencing School Mathematics won the 'Outstanding Book of the Year' award for education in Britain. She is an elected fellow of the Royal Society of Arts (Great Britain), and a former president of the International Organization for Women and Mathematics Education (IOWME). She is the recipient of a National Science Foundation 'Early Career Award', the NCSM Kay Gilliland Equity Award (2014) and the CMC Walter Denham Mathematics Leadership award (2015). She is the author of nine books and numerous research articles. Her latest book is Mathematical Mindsets: Unleashing Students' Potential through Creative Math, Inspiring Messages and Innovative Teaching (2016), and is published by Wiley. She serves as an advisor to several Silicon Valley companies. She was an Aspen ideas speaker and a White House presenter on girls and STEM. She recently formed www.youcubed.org to give teachers, parents and students the resources and ideas they need to inspire and excite students about mathematics. Her work has been published in the Times, The Telegraph, The Wall Street Journal and many other news outlets. She was recently named one of the 8 educators “changing the face of education” by the BBC. "I'm passionate about extending technology access for everyone and finding mission driven companies that can have an outsized impact on the world. I combine strong technical skills with strategic thinking, business acumen and conscientious leadership. I'm a savvy multi-tasker, and can work with global teams to accomplish lofty goals. I've worked in Silicon Valley, Boston, New York, Ethiopia, Ghana, Japan, Germany on a variety of interdisciplinary business and engineering problems." Theresa Johson holds a PhD in Aerospace, Astronautical and Aeronautical Engineering from Stanford University.